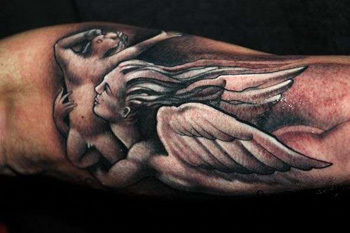 Angel tattoos are not your ordinary angel designs on the body because they can mean different things. 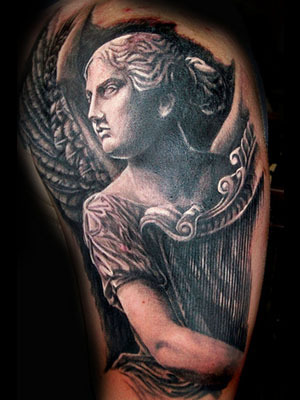 For one, in popular culture, angel tattoos symbolize your desire to portray a guardian role in someone's life. On the other hand, it can also mean to express your closer and deeper relationship with God, as angels are sent by God to watch over the Earth and guide human beings to having better spiritual and physical development. Angels may vary by rank, duties and responsibilities. There are those that have been assigned to safeguard the realms that exist in the universe such as the Arch Angels while some angels like cherubs, which people primarily know of, are tasked to protect and guide humans as they struggle in life. 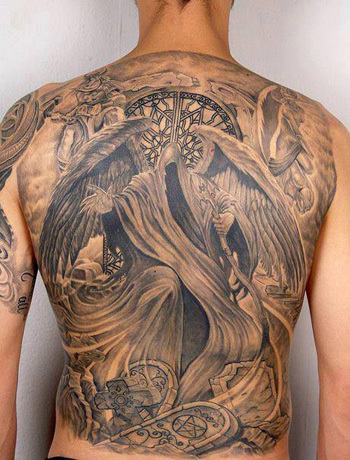 Therefore, this simply suggests that you have some option to choose what type of angel tattoo you are going to want on your body. As angels represent one's determination to overcome any adversity, it can also mean power, valor and victory. For example, Arch Angel Michael is considered as God's ultimate warrior who was sent on Earth to put evil entities right where they belong. Beyond this, though, Arch Angel Michael represent the light after (and against) darkness. His face can be used as an angel tat design to symbolize great spiritual strength that can expel evil things. An angel holding a harp is the most common design preferred by both men and women. The angels are drawn with sweet, graceful and innocent facial expressions as they try to entertain and praise the Lord with their harp. Another design under this type is an angel sitting on top of clouds as he watches over the Earth, or a loved one, as angels are also supposed to represent a human soul that had gone to Heaven after death. 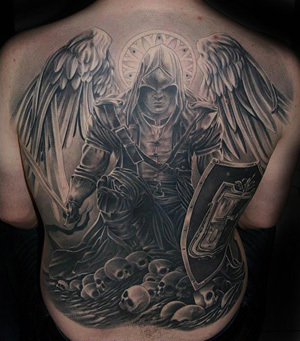 If you want to express your spiritual beliefs intensely, you may consider getting an angel tattoo holding a sword or a dagger. This design may also express your rebellious nature, though, as the sword design can be a good companion to fallen angels. History would tell you that fallen angels are the ones that have expressed allegiance to Lucifer as they disobeyed God and therefore were expelled from Paradise. 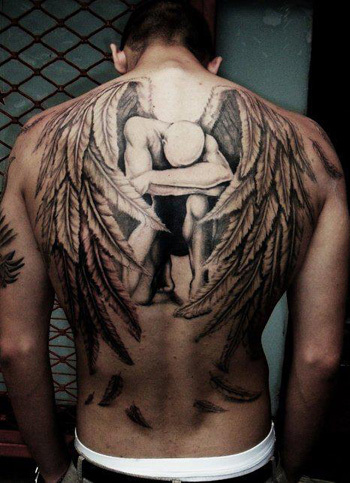 So, perhaps if you want to express your disapproval of the current government, you could have a fallen angel inked on your skin. It is important to make your intentions clear so as to avoid prejudices from people. This is where a talented tattoo artist would come in handy as he or she can help you formulate a design that would represent the meaning you want to express clearly. They sit on top of the "angel hierarchy". Next to God, arch angels are considered the most powerful spiritual and intellectual entities that was created. They had been born arch angels, and will continue to live as such unless they decide one day to go against the rules and commandments of God. This is one of the reasons why deeply religious people prefer this design over the others because of the spiritual intensity it could affect to them. Arch Angels are usually drawn with a shield and a sword, readying himself to battle against the evil. Also known as the defenders of all living things, guardian angels are tattooed on the body together with an infant or a younger child to surface the angel's caring and nurturing nature. People usually get this kind of design because they wanted to let people know that an angel is guiding them always. It could be an image of a deceased loved one with angelic characteristics and wings or a regular angel figure. Cherubs are the most innocent angels of all types. They physically resemble younger children, small in size and their wings are smaller than guardian and arch angels. Cupid is the most popular cherub around, and he symbolizes love and destiny. 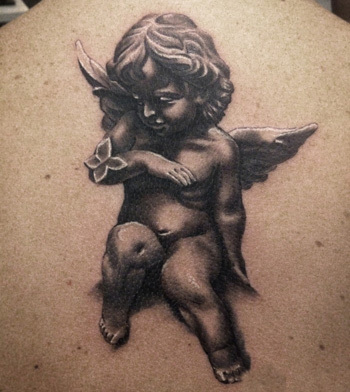 Thus, it is only logical to get a cherubs-inspired tattoo to express your great love for someone, with his or her name placed near the tattoo. Of course, if there is a protagonist, an antagonist should also come along with it in the story. Fallen angels are considered the antagonists of the battle between the good and the evil, because of they rebellious nature. They were exiled to earth to live with mortals as a consequence to their allegiance with Arch Angel Lucifer, who wanted to dethrone God. Fallen angels can choose to repent if they seek forgiveness, and then wait for the judgment day to come. This is also why in tattoo designs they are illustrated with faces of despair and melancholy while looking up to the firmament. People who usually get fallen angels inked on their skin have the desire to express their dark side, particularly their rebellious nature. They are in constant struggle against keeping this bad side of them from overcoming the good side. Most commonly referred to as the Grim Reaper, the Angel of Death is a popular dark angel icon that symbolizes all things on Earth are finite and the link between life and death. It is said that during the dying minutes of a person, death angel would appear to fetch the soul of that person and get him or her to the supposed destination. Or, the apparition of the death angel could suggest bad omen. However, the angel of death commonly features large-sized wings while on the one hand the grim reaper has without wings, wears a skull face, and is accompanied with a bladed pick-axe. Whatever your reason behind getting an angel tattoo, it can only suggest one thing: your strong belief on the life after death and the presence of spiritual entities on Earth. Therefore, this kind of tattoo deserves a special place in your body that you are going to want only the best for it from choice of colors, design, style, placement, and choice of tattoo artist. For the choice of colors, it has been established that (good-natured) angel tattoos go perfect well with light hues such as pink, blue, white, and yellow. However, light pigments do not last longer than dark colors so you should make sure that these warm colors have higher level of brightness to make it long-lasting. 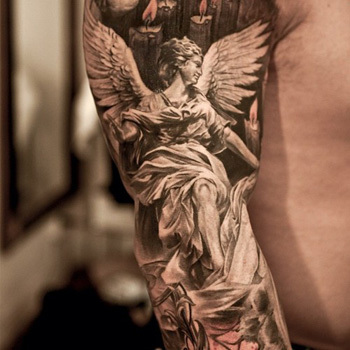 Another factor to take into consideration is the social and political conceptions that people have on angel tattoos. Think about how the tattoo would influence the people around you particularly your life partner and family, if it can bring negative or positive effects to them. You can just simply talk to them about it so you can decide where you must place the tattoo on your body.